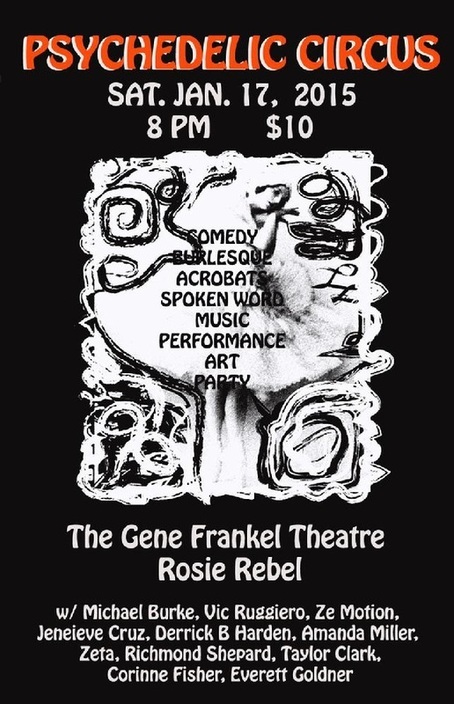 The Psychedelic Circus returns to the Gene Frankel Theatre. This time we seek to celebrate the axis between what is most fragile in life – real life and fantasy. We celebrate the unexpressed danglers. Comedienne, Innovator, Musician. Her smart sense of humor is combined with contemporary issues. For instance 'Rosie Rebel Juicer Bra' which feeds the poor and the audience, stirred up controversy with Heidi Klum on the Jay Leno show. Excerpt from "Michael Jackson was innocent and I didn't kill Jonbenet Ramsey, but I was there the night she died"
directed and visual design by Gian Marco Lo Forte and Pioneers Go East Collective. This amazing team of 5 will leave your audience speechless. They will be premiering on So You Think You Can Dance, on January 24th on fox networks. This piece will be performed for the first time at the Gene Frankel. Richmond Shepard has been active in Theatre and Film for over 50 years. He started America’s first ensemble Mime troupe in 1952, and performed with his company throughout the U.S. Since 2001 he has created Mime troupes in Jakarta, Indonesia, Los Angeles, New York and Derry, Ireland, and performed with those troupes. He now teaches Mime in NY and performs “Standup Mime.”- stories with visual images. You will find Derrick carrying his newly published book Slurs,Furs & Aliens. Derrick will be ready and able to share with you his philosophy on art and life. His book & music can be found on www.Only Popcorn.com. Derrick examines immortality and what one would do if you could live forever. Taylor has some really funny embarrassing comedy. We are excited to see what he has in store for us!! Corinne hails from the land of crunchy hair and malls. We are blessed to have Brooklyn own perform for us. Influenced by the Beats and compared to Bob Dylan. Performing from his new CD.